This is a scalable context timeline. 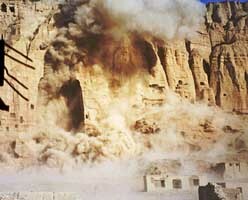 It contains events related to the event March 1, 2001: Taliban Disregard International Opinion and Destroy Giant Buddha Statues. You can narrow or broaden the context of this timeline by adjusting the zoom level. The lower the scale, the more relevant the items on average will be, while the higher the scale, the less relevant the items, on average, will be. 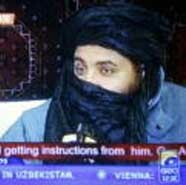 Mullah Akhter Mohammed Osmani’s appearance on Pakistani television, June 15, 2005. [Source: Agence France-Presse]Mullah Akhter Mohammed Osmani, a senior Taliban commander, gives an interview on Pakistani television, and says Osama bin Laden is in good health and Mullah Omar remains in direct command of the Taliban. [Reuters, 6/18/2005] Several days later, US ambassador to Afghanistan Zalmay Khalilzad will criticize Pakistan, pointing out that if a TV station could get in contact with a top Taliban leader, Pakistani intelligence should be able to find them too (see June 18, 2005).